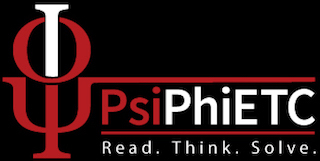 PsiPhiETC is committed to delivering selected books on Physics and Philosophy to the readers. The objective to enhance the reach of these books to interested buyers. Our primary focus is to deliver good quality products at a reasonable price. What's in a Name PsiPhiETC? The name PsiPhiETC is composed of three parts (1) Psi, (2) Phi and (3) ETC. Last part, ETC is pronounced as three letters "e" "t" "c" (NOT as etcetera). The letter E stands for Education, T for Training and C for Consultancy. With the blessings of Goddess Saraswati, we are trying to spread the knowledge of Physics i.e., Knowledge of Nature. Our written work is powered by the typesetting system TeX. The tagline (slogan) is three words "Read. Think. Solve." First part Psi is pronounced as Sai. It sounds like sanskrit letter स (sa), the first letter of सरस्वती (Saraswati). It's symbol is greek letter Ψ. In TeX, it is typeset by the command \Psi. Middle part Phi is pronounced as Fai as in sci-fi. It's symbol is greek letter Φ. In TeX, it is typeset by the command \Phi. The symbol Φ is also used to represent Golden Ratio or Divine Proportion. To us, Φ represents nature and its exploration. 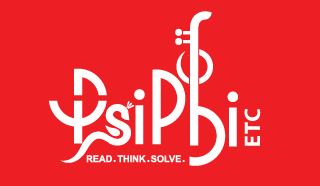 In a nutshell, PsiPhiETC is pronounced as Sai-Fai-E-T-C, its symbols is ΨΦETC and represents Saraswati, Nature, and Education Training Consultancy. We are still in the process to arrive at consensus on logo. We started work on logo with Logo Design India and they came with some of the good ideas as shown below. We would love to get suggestions/ideas on logo from you. 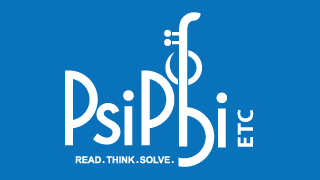 A casual look at the logo should clearly show the name PsiPhiETC. A little serious look should reveal the symbols Ψ and Φ. A careful look should reveal Saraswati and Golden Ratio. Saraswati's four hands with Veena, Peacock (or Swan), and Lotus looks like the symbol Ψ. The most difficult part of the logo is to harmonize symbol Ψ with Goddess Saraswati.